Showing off your company at a trade show is a great way to gain new exposure and generate leads – but only if you catch the eye of consumer. Here at Beyond Spots & Dots, we are committed to ensuring that your business is ready to make a memorable first impression. From tablecloths to backdrop displays and everything in between, our expert team will work with you to make sure your business stands out from the crowd. We specialize in creating professional, eye-catching displays that will help your booth attract new customers, allowing you to start building new relationships. Who doesn’t like free stuff? Prizes are great motivators for potential customers to visit your booth space and check out your company. We’ll design an attention-grabbing raffle box for your trade show contest. Our team will design and order branded storage containers to keep your convention materials in. We can help to design and order branded cases such as laptop bags and more, complete with your company logo. 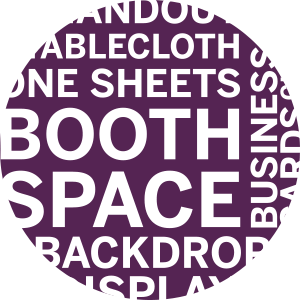 You’ll need all the essentials for a standout trade show booth, so we’ll set you up with chairs, tables and whatever else you may need! You need somewhere to display your materials at events, so we’ll secure the tables for your booth. Sit down and relax. No, really. We’ll obtain necessary seating for your booth. To effectively display your product one-sheets, we’ll design and secure sturdy holders to put at your table. Be it a branded standing shelf or something more basic, the team at Beyond Spots & Dots will create & provide a means to present the brochures that feature your brand and products. Do you want a rug with your logo on it to customize your trade show space? Our design team will take care of it! We’ll make sure your booth space has adequate lighting so that customers can get the full impact of your thoughtful display. Having a trade show? Exhibitors need banners to attract attention to their booths, and we have the skills to produce attention-getting banner signs. From outdoor signs to be placed around the event venue to tabletop displays for booths, we’ll develop the best signage solutions to fit your needs. Our designers will create specialty tablecloths for your large-scale events using innovative designs and high quality fabrics. In a tag-team effort, our designers and writers will craft compelling content and graphics for your company’s inclusive & informative brochure. Promotional wrist bands may feature your company’s Web address, slogan and/or logo to get your name out there. Our design team will create standout branded apparel, like t-shirts, hoodies and hats, featuring your logo and distinct artwork to hand out to visitors and customers. Beyond Spots & Dots will create your business cards in various shapes, sizes and colors to best represent your brand and to blend seamlessly with the appearance of other company communication materials like letterheads. We can help you plan, prepare for and staff events, conferences and exhibit booths, giving you the opportunity to not only promote your products and services, but put a professional face to your brand.